As a believer, chances are that you will be challenged by an unbeliever regarding your faith at least once in your lifetime. You will or have attempted to share the truth of the gospel with them but there is always some reason why they will not hear you. The Bible says that you should “…be ready always to give an answer to every man that asketh you a reason of the hope that is in you with meekness and fear” (1 Peter 3:15). I say that we can be ready, however doing it with meekness and fear is not always how it turns out, especially when you are dealing with a difficult unbeliever, right? 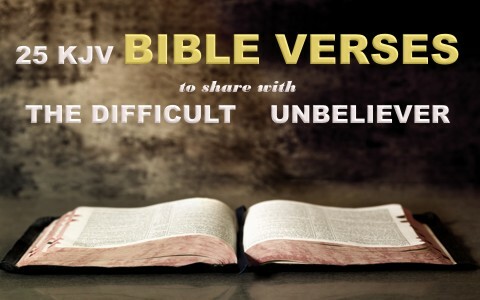 To help equip you to give that answer, here are 25 KJV Bible verses to share with the difficult unbeliever. These are some verses to answer some very common excuses. Luke 12:19–20 And I will say to my soul, Soul, thou hast much goods laid up for many years; take thine ease, eat, drink, and be merry. But God said unto him, Thou fool, this night thy soul shall be required of thee: then whose shall those things be, which thou hast provided? Jude 24–25 Now unto him that is able to keep you from falling, and to present you faultless before the presence of his glory with exceeding joy, to the only wise God our Saviour, be glory and majesty, dominion and power, both now and ever. Amen. Hebrews 2:1–4 Therefore we ought to give the more earnest heed to the things which we have heard, lest at any time we should let them slip. For if the word spoken by angels was stedfast, and every transgression and disobedience received a just recompence of reward; How shall we escape, if we neglect so great salvation; which at the first began to be spoken by the Lord, and was confirmed unto us by them that heard him; God also bearing them witness, both with signs and wonders, and with divers miracles, and gifts of the Holy Ghost, according to his own will? Before we knew Christ we too had excuses. Sometimes we need to step back and remember the day when we thought like an unbeliever. Then we need to call upon the Holy Spirit to give us just the right words. We must remember that Jesus sent us out among the unbelievers to share the good news of the gospel of Jesus Christ. We must also be careful to season our words and share the Word of God with meekness and fear. Jesus said “Behold, I send you forth as sheep in the midst of wolves: be ye therefore wise as serpents, and harmless as doves” (Matthew 10:16). Don’t push it — don’t beat them over the head with the Bible. Know the Word and incorporate it into your daily conversation. Let the Holy Spirit use you as a tool to draw them to believe. This is so good Pam. I really try to befriend atheists as they are not our enemies at all…in fact, once, we were the enemies of God (Rom 5:10), but the verse that I believe is best is Isaiah 55:6 “Seek ye the LORD while he may be found, Call ye upon him while he is near.” I think this one makes them think that their time will eventually run out. Thank you for publishing this. Previous post: Why Are Christians Sometimes Unkind To Atheists? Next post: Why Did God Create Pets?